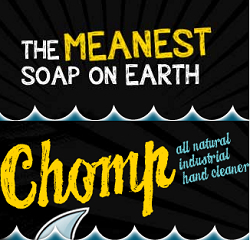 Get a free sample of Chomp Soap when you fill out the request form. Please be aware that a phone number is required. If you don’t feel comfortable providing this information, please pass on this deal. You can always use a free Google Voice number if you don’t want to provide your real one. To load the request form, just click on the yellow ‘Get Your Free Sample Today’ button.